Info "Turn the round ground around and get the item!" Clu Clu Land is one of 9-Volt's microgames in WarioWare: Twisted! It is set in the NES game of the same name. 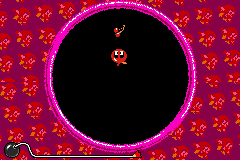 The object is to guide Bubbles to the item without getting hit by a Unira. When the player collects the item, several ingots appear in a random shape (usually a star). Level 1: There are no enemies. Level 2: There are two Uniras. Level 3: There are two Uniras and a black hole.